in a different part of the brain than dogmatic religious belief. 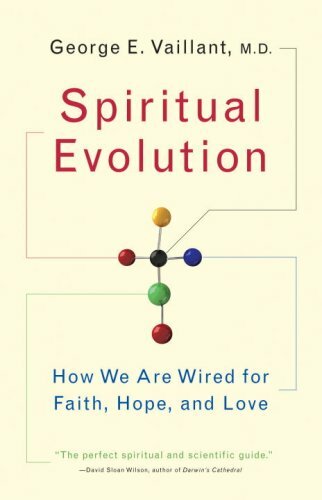 Evolution has made us spiritual creatures over time, he argues, and we are destined to become even more so.Spiritual Evolutionmakes the scientific case for spirituality as a positive force in human evolution, and he predicts for our species an even more loving future. Vaillant traces this positive force in three different kinds of "evolution": the natural selection of genes over millennia, of course, but also the cultural evolution within recorded history of ideas about the value of human life, and the development of spirituality within the lifetime of each individual. For thirty-five years, Dr. Vaillant directed Harvard's famous longitudinal study of adult development, which has followed hundreds of men over seven decades of life. The study has yielded important insights into human spirituality, and Dr. Vaillant has drawn on these and on a range of psychological research, behavioral studies, and neuroscience, and on history, anecdote, and quotation to produce a book that is at once a work of scientific argument and a lyrical meditation on what it means to be human. Spiritual Evolutionis a life's work, and it will restore our belief in faith as an essential human striving. Rom Brafman is a psychologist with a private practice in Palo Alto, California. He is also the co-author of the books Sway and Click.George E. Vaillant, M.D., is a psychoanalyst and a research psychiatrist, one of the pioneers in the study of adult development. He is a professor at Harvard University and directed Harvard’s Study of Adult Development for thirty-five years. He is the author ofAging WellandThe Natural History of Alcoholism, and his 1977 book,Adaptation to Life, is a classic text in the study of adult development. He lives in Boston; East Thetford, Vermont; and Victoria, Australia.